Charles and Mary Tinson wed at Harvey’s Supermarket in Albany, Ga., on Nov. 24, 2016. Well, bowl me over with a turkey feather. A South Georgia couple decided to make their love official by marrying not only on Thanksgiving Day but also at the grocery store where they reconnected. Four years ago, Charles Larry Tinson reportedly ran into the Harvey’s Supermarket to pick up some cranberry sauce for Thanksgiving. As he searched the aisles, he ran into Mary, someone he had not seen in years. “I heard someone say, ‘Hey, girl,’ and I turned around and said, ‘Oh, my God; Larry? I haven’t seen you in over 20-something years,’” Mary Tinson recalls. Apparently Charles had his eye on Mary for some time. “You can often tell when a man has a crush on you,” said the new Mrs. Tinson. When he popped the question, Larry knew exactly where he wanted to make his vows. “She asked me where are we going to get married, and I said at Harvey’s, where I met you,” said Larry. 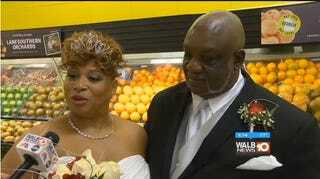 The Albany, Ga.-based supermarket assisted Mary and Larry with the planning and helped with the live music and the wedding cake. And what do you think the 70 guests received as wedding favors? You guessed it: a can of cranberry sauce to mark the special day.